James H. -- "Elder of the Tribe"
During this 71 minute DVD, recorded on August 22, h 2005, James descries his drinking career, his recovery beginning on December 12, 1934 (one day after Bill W.), how he met and attended meetings with Bill in the 1930's, the original program of recovery, and how he carries the A. A. message today. Filmed in "half-shadow" to protect James' anonymity. 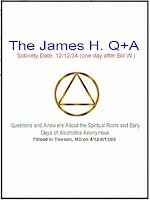 During this two hour DVD, James answers more than 40 questions on topics of historical significance to anyone interested in the foundation and the "original" program of Alcoholics Anonymous. Filmed in Towson, MD on 4/12-4/13/05. Is James H. a member of A.A.? Is James H. a recovering alcoholic? Is James H. a member of the Oxford Group? Sometimes there are no easy answers even when the questions seem to be simple and straightforward. This is certainly the case when trying to explain the relationship of James H., the Back to Basics Beginners' Meetings, and Alcoholics Anonymous. Although there are now more than 2,000 Back to Basics Beginners' Groups throughout the world which have produced more than 100,000 recoveries, there are still people within the A.A. community who are unfamiliar with this "original" meeting format or the role James H. has played in bringing this highly successful "design for living" back to the fellowship. James is the last living link to the spiritual roots of the Alcoholics Anonymous program that produced a 75% recovery rate from alcoholism. Many people today know very little about the early days, except for what they have read or what they have heard from some "old-timers" (actually newcomers compared to James H.) who sobered up in the 1970's. They don't realize that the program of the 1970's was quite different from the "original" program of the 1940's. The program has continued to change over the years and has reached a point where today A.A. has only a 5-10% recovery rate, depending upon which study you read. James H. is truly a unique individual. He is ninety-five years old, sixty-six years sober, and one of the greatest "life-changers" of the past one hundred years. Just like Bill Wilson, Dr. Bob Smith, and the other "Big Book" authors, James H. found God and sobriety in the Oxford Group. And, just like Bill Wilson, Dr. Bob Smith, and the other "Big Book" authors, James had his spiritual awakening as the direct result of taking the Oxford Group Four Steps of Surrender, Sharing, Restitution and Guidance. James attended Oxford Group meetings with Bill Wilson in Frederick, MD from 1935-1937. The Oxford Group considered all addictions to be equally detrimental in terms of cutting a person off from God. There was no more emphasis on alcohol than there was on smoking, womanizing, or drug addiction. All of these behaviors left us in the dark relying on self-will, rather than God's will to solve our problems. The Group believed that self could not overcome self. Only God could remove our addictions and afflictions, provided we established an intimate two-way relationship with Him. In 1937, Bill left the Group to work full time with alcoholics. As James explains it, when Bill Wilson left the Oxford he didn't take all the drunks with him. James remained in the Oxford Group, as did Rowland Hazard, Cebra Graves, Victor Kitchen, and Charles Clapp among others. In fact, Dr. Bob didn't leave the Group until 1940; almost a year after the "Big Book" was written. James is the only person alive today who has first hand knowledge of the material Bill Wilson and the other "Big Book" authors used to write the book Alcoholics Anonymous. On numerous occasions, he has stated that the "Big Book" is Oxford Group literature written for a specific segment of the Oxford Group fellowship. James is a recovered alcoholic, which is the term used by Bill Wilson, Dr. Bob Smith and the A.A. pioneers. The word can be found seventeen times in the first 164 pages of the "Big Book." In addition, James sometimes refers to himself as an ex-alcoholic. This expression was used in the first ten printings of the first edition of the "Big Book." In 1947, "ex-alcoholic" was changed to "ex-problem drinker." James does not identify himself as an alcoholic from the podium. Here again he follows the precedent set by Bill Wilson, Dr. Bob Smith and the A.A. pioneers. Neither Bill nor Dr. Bob ever identified themselves as alcoholics when speaking at A.A. meetings. To verify this all you have to do is listen to the audio tape recordings of their speeches. The ritual of identifying oneself as an alcoholic, followed by a chant from the audience of "Hi _______," also came from the treatment centers decades after the fellowship came into being. It is not a part of the "original" A.A. program. Keep in mind that James H., Bill Wilson and Dr. Bob Smith all found permanent sobriety in the Oxford Group. If we say that James H.'s sobriety date isn't important because he sobered up in the Oxford Group, then we must say the same thing about Bill and Dr. Bob. No. James H., Bill Wilson and Dr. Bob Smith all had drinking problems, which they overcame in the Oxford Group as the direct result of taking the Four Steps of Surrender, Sharing, Restitution, and Guidance. Since December 12, 1934, James has been a recovered alcoholic or ex-alcoholic. 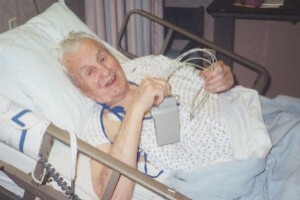 James H. was a member of the Oxford Group in the 1930's and is a member of Moral Re-Armament today. He is also a member of the Hunt Valley Rotary Club and the Towson, MD Methodist Church. Although the Oxford Group, as such, does not physically exist anymore, the principles of the Group are just as valuable as a "design for living" today as they were in the 1930's. Both James H. and I apply the Four Standards of Honesty, Purity, Unselfishness and Love to our thoughts, words and deeds; use Restitution to become life-changers; and rely upon the Guidance of God to direct every area of our lives. In this sense, the Oxford Group is alive within each and every person who practices the "original" A.A. program in order to witness once again the miraculous results obtained by our A.A. pioneers. Coming soon -- The James H. Scrapbook! On April 16,17 & 18 1999 Wally P. and James H. presented Barriers to Bridges - Changing the World One Life at a Time at the Wilson House in East Dorset, VT. Just as his book, Back to Basics - The Alcoholics Anonymous Beginners’ Meetings is a return to the spiritual roots of A.A., Wally P’s forthcoming book, How to Listen to God is a return to the spiritual roots of the Oxford Group. Participants completed the Oxford Groups Four Spiritual Principles of Surrender (Steps 1,2, & 3), Sharing (Steps 4,5,6, & 7), Restitution (Steps 8 & 9) and Guidance (Steps 10,11 & 12). Each person in attendance practiced two way prayer and shared their guidance from God. This was most certainly a life changing event. Barriers to Bridges was the re-enactment of an Oxford Group Houseparty. The meetings were hosted by James H., who has been an Oxford Group member for over 70 years. His sobriety date in the Oxford group is 12/12/34, the day after Bill Wilson checked into Towns Hospital. "James is 94 years old. We must preserve his story for the millions yet to come. In reality, he is the 'elder of the tribe'." "In the past three years alone, tens of thousands of lives have been changed as the result of Back to Basics. He is the person who started it all."